Release of kidnapped Claretian missionaries: "Our thoughts went to our martyrs"
Douala (Agenzia Fides) - "Give a man a fish and you will feed him for a day, teach him how to fish and you will feed him for life". The Jesuits of West Africa have taken this ancient proverb to the letter. 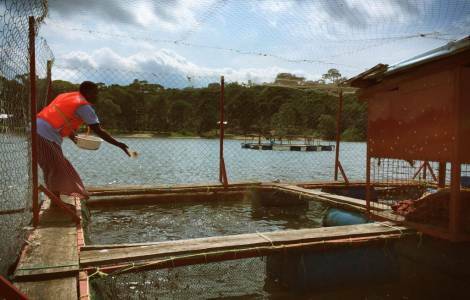 And, faced with the emergence of uneducated and unemployed youth in Cameroon, they thought of a project that would teach young people how to breed fish and sell it. In Africa, school dropout is a significant problem. On the continent, over three million students fail to reach the minimum level of school education. In Cameroon, 70% of girls are illiterate. This phenomenon is particularly visible in the northern regions, where it affects over one million girls between the ages of 10 and 19, which represents 31.9% of all girls in the region. The Jesuits have decided to respond to the problem through an entrepreneurial initiative. This is how fish breeding was born. At the end of 2017 agronomists and fish farming experts held a series of meetings on fish farming. In addition to the technical-practical training, young people were taught the basic principles of marketing (on media, social networks, etc.) to deal with not only the problems of production, but also those of the sale of products. The operational phase started in January. The young put into practice the teachings and already at the end of February we saw the first results with the production of a first batch of freshwater fish. "The project - the local Jesuits stress to Fides - wants to offer young people basic technical knowledge so that they can integrate into the social and professional context of the province of Douala. EUROPE/ITALY - The Jesuits: "To dare the missionary spirit in the contemporary world"